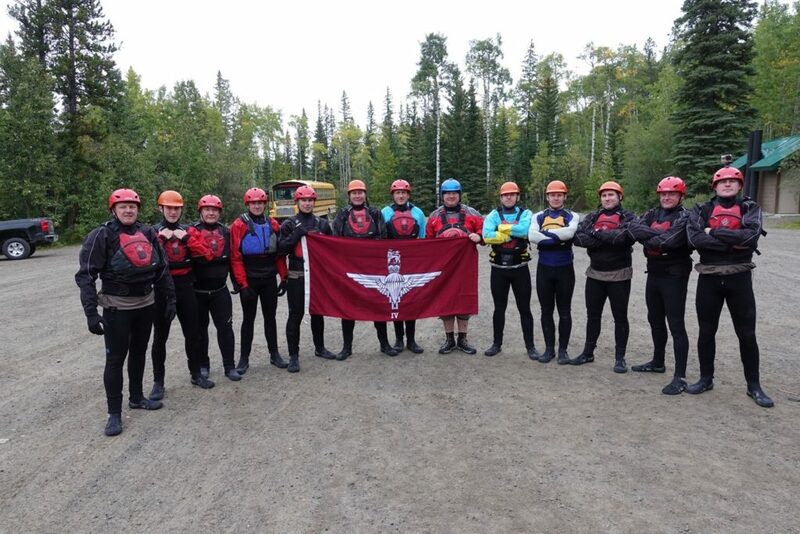 Army Reservists from D Company 4th Battalion the Parachute Regiment in Rugby recently took part in a ten day Adventurous Training package in Alberta, Canada. It has been a busy period for the 4th Battalion the Parachute Regiment (4 PARA), from supporting our sister Regular Battalions on Exercise Joint Warrior to overseas exercises in the Ukraine and a two week Battle Camp in Sennybridge. So, what better way to end a run of exercises than with Adventurous Training (AT) to the Canadian Rockies? Proving that the One Army Concept continues to deliver 4 PARA have trail blazed the way becoming the first Reserve Unit to take on and successfully deliver a ten day adventurous training package out of Trails End Camp (TEC) in Alberta, Canada. TEC’s excellent facilities are usually reserved for exercising troops and permanent staff at the British Army Training Unit Suffield, and provides all ranks the chance to try their hand at something apart from Warcraft. What is less well known is that TEC is also open to the wider Army with Headquarters Adventurous Group (Army) annually sponsoring a number of Adventure Training slots at TEC throughout the year. And what a great opportunity for the Regiment. Recruiting nationally with Companies situated in Glasgow, Nottingham, London and with its Headquarters in Leeds, 4 PARA continues to grow bigger and stronger. 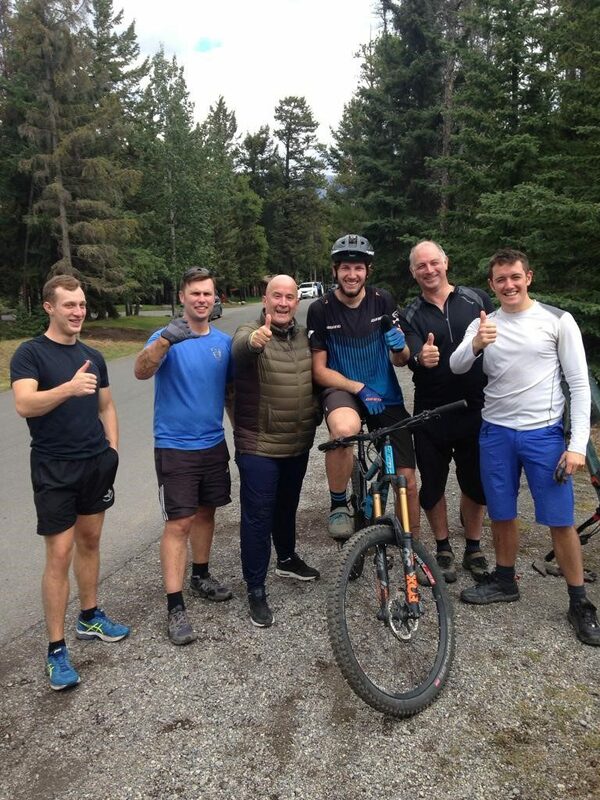 This year 14 Paratroopers disappeared deep into the North West Territories to tackle the Ghost, Red Deer and Kananaskis Rivers and forge a path down the mountain biking trails of Canmore and Banff National Park on Exercise Northern Black Maple. After arriving at TEC in early September, and amidst autumnal sunshine, the expedition was split into two groups, who quickly familiarised themselves with their equipment. D Coy’s Sgt Toogood enthusiastically threw himself into the ‘dry’ training as the remainder acquainted themselves with their instructors; B Coy Kayaking trainer LCpl Gary Archer and Mountain Bike Trail Leader, D Coy CSM WO2 Ian Chick. As the groups set off for a rotation of Kayaking and Mountain Biking little did anyone realise that the bright sunshine and 26 °C heat would soon be replaced by snowfalls and temperatures as low as -3 °C leaving a few participants wondering what they had signed up for. For the Kayakers the aptly named Ghost River (lost souls, etc) provided a stretch of slow moving water with which to begin the training, but then quickly moved on to faster flowing stretches, once the basics had been taught and mastered. Much to the horror of Pte Matt Stark as it quickly became apparent that his vision of calmly kayaking in the sunshine on a flat lake with a fishing rod was rapidly crumbling away! Each paddler became adapt at rescue, from self-help to aiding others. The procedures to be followed when capsizing or when outside the kayak in fast flowing rapids were repeatedly drilled by all and more often than not when least expected! The concept of paddling was second nature to some but not to all and it was not until the end of the second day, and after numerous spins, twists, turn, bumps and capsizes, that everyone felt confident and practised in the kayak and its movement in the water. 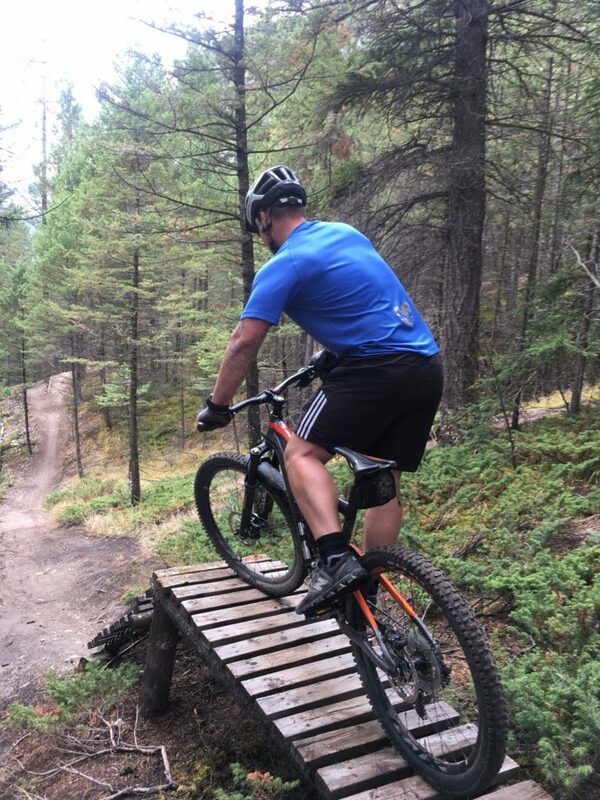 Meanwile the Mountain Bikers had moved to Canmore Nordic Centre to learn the fundamentals of Mountain Biking maintenance, fitting and eventually trail riding. Over the course of the next couple of days they experienced progressively harder and technically more complex trails, culminating in arduous rides set within the breathtakingly beautiful scenery of Banff National Park. Day 2 for the kayakers saw them move onto the Kananaskis River, where the water ran faster and deeper. The Kayakers practiced rescue drills before clambering into the boats and honing the mysterious skill of ferry gliding before heading 10km downstream. The next days signalled the start of the arduous phase with longer rides for the Mountain Bikers and for the Kayakers this meant a 2 hr drive to the Red Deer River; the start of a 26km long and sometimes emotional experience. 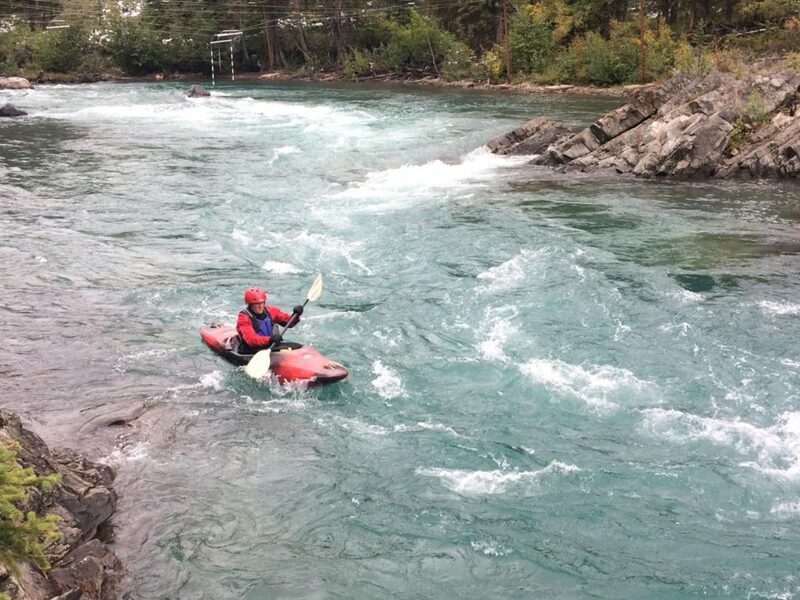 All the Kayakers were challenged, navigating some seriously technical sections of the river. The narrow margin for error in these fast flowing rapids could spell disaster but all came away from the experience mastering the entry and exit into white water and the safer eddies, although not always in the manner and direction the instructor had wished. Several long hours of paddling (and capsizing) later the much repeated question – “are we there yet?” met with the same response – “nearly it’s only another 2k”. Eventually the reply was authenticated, and the take out point was reached – a campsite, which the next day, saw two campers attacked by a bear. However, the season and weather are immensely changeable in Canada and it was not long before the sun gave way to clouds and snow. The Mountain Bikers donned trousers and found they had to adapt their technical riding skills to cope with a fresh fall of snow which rapidly melted to ensure everyone, and everything was provided with a layer of muddy camouflage. For the Kayakers a return to the Ghost river felt very different as the water level had risen and temperatures hovered just above freezing. The Last day of the rotation saw the sun return and the Mountain Bikers head to STAR WARS to negotiate the RETURN OF THE JEDI. WO2 Chicks frustration at being tailgated down this fast purpose built trail turned to surprise as, once at the bottom of the run, the culprit turned out to be A JEDI MASTER and non-other than Mountain Biking World Champion Greg Minnaar who happily posed with the group before heading off. Meanwhile a move by the paddlers to Calgary and the faster flowing water of the skills centre at Harvey Passage, resulted, in the now ‘expert’ kayakers utilising the traditional practice of ‘bags of smoke and straight up the middle’ rather than putting their training to good use – much to the consternation of LCpl Archer and the Calgary River Police who watched on with amusement. And then all too soon, the training over, it was time to return to the UK, the normality of civilian careers and the busy routine of Battalion life. But not to be forgotten is that Adventurous Training is a key military training activity which supports operational effectiveness and the ethos of the Army with the participants of Exercise Northern Black Maple being challenged both physically and mentally. They were also able to achieve the K2F Kayaking qualification through Distributed Training and take the first step in becoming the instructors and leaders of the future whilst faining welcome knowledge of the Canadian Wilderness and experiencing a truly special place. To find out more about The Parachute Regiment visit the Army’s website here. You can also find out more information about joining the Army Reserve here.